Question or Message for Jay? Cross-draw, horizontal carry, pouch style sheaths. Built for a set of three hunting knives, with the owner’s initials stamped vertically on the front of each. An example of the front and back view, of two small horizontal carry sheaths. They will fit on most any width belt and stay put. Horizontal carry pouch sheath: fully adjustable (tilt) from horizontal to full vertical. From the custom knife shop at the Buck Knife Company comes an elk antler handled Bowie knife – a great knife, but a poorly designed sheath. The knife’s owner wanted to carry his two ceramic sharpening rods on the sheath so we built a long tube holder down one side as part of the sheath’s welt. He also wanted to carry his favorite Leatherman tool on the sheath. A fold-over flap pouch on the front of the sheath was the perfect place for it. He didn’t want to carry the knife with it hanging vertically down his hip and getting in the way. The solution was to build a cross-draw, horizontal carry sheath with a slight tilt upward for the handle area. Getting the balance point for this rig was important and we did it. Just in case the owner wants to lash the sheath to a backpack, we included four tie-town holes around the outer edge. A Tom Brown Tracker knife who’s owner needed a replacement for the kytex sheath it came with. His wish list of requirements for the new water buffalo hide sheath was just what you would want if you went camping with your Tracker. He needed a holder for his “fire-starter” and another one for his retractable, diamond-coated sharpening steel. I built the two holders into the sheath’s welts down each side. He also asked for some lashing points so it could be tied onto a backpack. We gave the sheath two holes at the top and two at the bottom to do just that. Lastly he wanted to carry the knife horizontally on his belt but out of the way on his back. So we built him a cross-draw sheath with perfect balance to take with him on camping trips. A large sheath for a big knife built for the Wild Boar Hunter, this sheath has a slight cant upward so the knife handle is at a more “at the ready” position. For a different look this sheath has leather lacing around the edge rather than hand stitching. Dyed a dark brown with the owner’s three initials stamped on the front completed the project. A cold steel Master Hunter in need of a horizontal cross-draw sheath – so we built one. We dyed it black and gave it a slight tilt upward – called an F. B. I. cant. For a Tom Brown Tracker (W. S. K.), we built this deluxe style sheath in a horizontal carry method. To keep this heavy knife in place we added two keeper straps and, to give the owner a few extra options for carrying it, we added four lashing holes around the outer edge. A small sheath pulling double duty as a vertical carry with a standard belt loop on the back. Also as a horizontal carry with a wrap around belt loop with a snap closure. When building a typical horizontal carry sheath, we attach two belt loops to the back. The loops are large enough to accept a two-inch wide belt. However, if the sheath is on the small side the belt loop system will not work. The solution – one belt loop built in as part of the sheath. It wraps around the sheath and the belt then snaps down on the front. This method also allows the knife/sheath to be removed without taking off your belt. For a small knife and sheath, that doesn’t have much room on the back for 2 belt loops, this design works very well. We start with a typical pouch style sheath, then add one wide belt loop, that folds over the belt, and snaps down, on the front of the sheath. Image shows front view and back view. Here we have my model #503 Wild Boar Hunter, set up for a customer who rides a motorcycle. He asked for a horizontal carry sheath, that will ride across the small of his back. The 2 belt loops on the back of the sheath, are “off-set” to give the knife handle a slight cant upward, for an easier draw. Image shows front view and back view. Thanx for the beautiful knife. The Wild Boar Model – the quality and artistry are the best I have seen – worth every penny. I don’t think one could wear out the water buffalo scabbard in a lifetime. The heft of the handle and balance overall is great. Read of profile of Jay Maines and Sunrise River Custom Knives in the Forest Lake Area Lowdown. Sunrise Custom Knives was featured in the August 2001 issue of Armi, an Italian magazine. 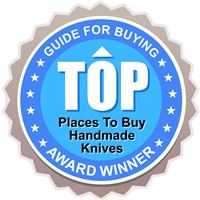 Read a review of Sunrise River Custom Knives from the November 2000 issue of Tactical Knives magazine.